"It's as if there were a piece of the sun...locked up in here..."
In 1942, Mrs. Miniver was one of the biggest and most popular prestige pictures of the year, making loads of money for MGM and winning six Academy Awards, including Best Picture. Much of the film's success was rightly attributed to the charm and chemistry between the leads, Greer Garson (winner for Best Actress) and Walter Pidgeon. Naturally, MGM set about reuniting the two, and Madame Curie was born the following year. The outline of the story is well known: Marie Sklodowska and Pierre Curie meet, fall in love, and as scientists make the discovery of any number of lifetimes: a new form of energy, and a new element. Radium. The director, Mervyn LeRoy, is rarely mentioned in the same breath as the greatest Hollywood directors. He was, though, a prolific force in the film industry for decades, producing and directing literally dozens of films, many of which are recognized as classics themselves (Little Caesar, Quo Vadis, Mister Roberts). He was well suited to a movie like this: a big prestige picture that had to hit all the right buttons and make good use of its respected talent. Greer Garson was one of the most popular actresses of the '40s, and Pidgeon was no slouch in the box office game, either. Here, Garson spends a bit too much time staring, wild-eyed in scientific rapture, and Pidgeon coasts a bit on his natural charm, but they still manage to bring the characters to life. LeRoy works his own bit of magic: while much of this plays as rote prestige picture (probably why, in spite of its own Oscar nods, it isn't remembered in the same breath as Miniver, there are moments of absolute filmmaking brilliance. When the story focuses on the science, it's surprisingly most affecting. There's real drama and intensity around the scenes where the Curies are within a hair's breadth of making the most important scientific discovery in centuries, and the setbacks are crushing. The camera goes in tight on Garson's face early on, when measuring the energy outputs of the various substances extracted from an ore that will turn out to contain radium. Those energy output numbers are critical to the plot, and director LeRoy plays them just right. When, after years of struggle, the Curies suffer what appears to be a fatal setback, my heart sank along with theirs. The film also does a great job of simplifying and clarifying, without dumbing down the science. It works best as a celebration of science, and allows pure discovery to feel as exciting as any prize fight or swashbuckling adventure, with as much joy and heartbreak. It does these things as well as any movie I've ever seen, but unfortunately that's not all there is. The proceedings too often get bogged down in the good-natured romance between the two leads. They're both affecting in their parts, and the actors are certainly charming enough to keep things moving along, but their interactions outside of the lab just aren't particularly interesting. Viewers with even the slightest knowledge of history, or who are paying attention at the movie's beginning, will understand instantly that the future Curies must wind up together, yet the courtship between the perfectly matched, never conflicted lovers is drawn out in a manner that's a bit tiresome. No matter how difficult things get in life, they never quarrel or second guess each other. They're just so darn perfect together, and awfully well meaning. Things are much more interesting back in the lab, and I found myself constantly wishing that they'd just get back to work already. The construction mirrors the lives and work of the Curies: tedium, punctuated by moments of inspiration. There's a great film within Madame Curie, but it's not all great. Much of its over two-hour running time is standard, if extremely handsome, historical biopic. The leads are charming, the production values are spectacular, but it only comes alive in making the process of scientific discovery tense and exciting. For doing that so well, alone, it's worth seeing. Just beware the padding. Image Transfer Review: Quite good, but not among the best of Warner's classics. Contrast is beautiful and sharp, so the black and white really pops, but the transfer is marred by some mild graininess and occasional very fine scratches. Audio Transfer Review: The original mono track is in great condition, with no crackle or fading. It's strong and clear. Extras Review: The main extra is the Oscar-nominated 1937 short film Romance of Radium. At 9m:37s, it's certainly appropriate, covering much the same ground as the film in a vastly shortened format. Prolific narrator Pete Smith sounds like he should be calling a baseball game rather than chronicling the discovery of radium, but it's still a neat addition (it also harkens back to a time when radiation had much more noble connotations). The other extra is a Greer Garson Trailer Gallery, including trailers for some of her best known films, including this one. 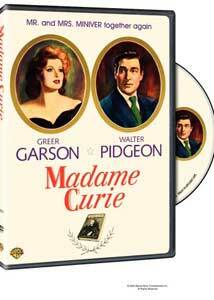 Much of Madame Curie is standard-issue (if high-end) historical biopic, a prestige picture made to capitalize on the Greer Garson/Walter Pidgeon chemistry that had won Oscars the year previous. That chemistry, though, is very real, and carries the audience through the more lethargic elements. The film comes alive when celebrating scientific discovery, in a manner that few carry off very well. A nice short on radium and quality (though imperfect) transfers make this worth checking out for classic film fans.